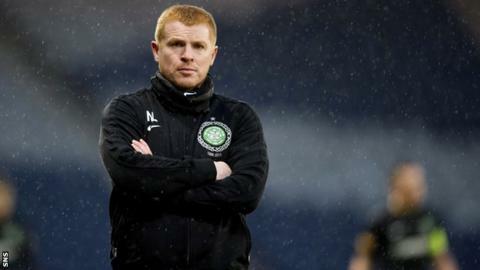 Neil Lennon has garnered almost universal praise for his work since taking charge at Celtic. One league championship delivered, with another appearing to be on the way, one Scottish Cup and qualification for the last 16 of the Champions League is an impressive list of achievements. However, one considerable blemish on Lennon's CV is his side's recent form in cup ties at Hampden. St Mirren's 3-2 victory in the semi-final of the Scottish Communities League Cup is not the first time Lennon's men have come unstuck at the National Stadium in recent years. Since the Northern Irishman was given the Celtic reins, initially on an interim basis to replace Tony Mowbray, his side have lost five crucial cup ties at Hampden. Here we examine Lennon's Hampden defeats as Celtic manager. Lennon took over a squad in disarray following the sacking of Tony Mowbray, but Celtic were still hot favourites to take care of the First Division outfit and advance to the Scottish Cup final. However, Steven Craig and Martin Scott scored to give Derek Adam's men a glorious victory, and inflict one of the worst results in Celtic's history. The scoreline was expected to end Lennon's candidacy to take the manager's job on a permanent basis, but the Celtic hierarchy decided that, despite this disastrous loss, he was the man to restore Celtic's fortunes. A meeting of the master and the apprentice as rookie manager Lennon took on wily old fox Walter Smith in the Rangers dugout. Steven Davis drew first blood for Rangers with an inch-perfect finish from 20 yards, but a towering Joe Ledley header pulled Celtic level. The sides couldn't be separated after 90 minutes, but Nikica Jelavic struck in extra-time to win the Cup for the Ibrox club. Kilmarnock had never won the League Cup and that statistic wasn't expected to change in this final. Celtic saw chances come and go, but couldn't find a way past the Killie defence. They were punished six minutes from time when Dieter van Tornhout rose highest to bury a header past Fraser Forster and create history for the Rugby Park side. Lennon's former team-mate Craig Beattie came back to haunt him with a last-gasp winner to set-up an all-Edinburgh Scottish Cup final. Rudi Skacel had given Hearts the lead early in the second-half, but Gary Hooper appeared to have forced extra-time with an equaliser three minutes from time. However, Joe Ledley was controversially penalised for a handball in the penalty area, and Beattie dispatched the spot-kick at the death to send the Tynecastle side through. An angry Lennon confronted referee Euan Norris on the pitch at the full-time whistle to offer his view on the penalty. Neil Lennon had warned his side that one false move could see their Treble dreams extinguished. Clearly the warning wasn't heeded as St Mirren recorded a famous and thoroughly deserved, victory. St Mirren striker Esmael Goncalves opened the scoring on his debut for the club, but Gary Hooper equalised just before half-time. Charlie Mulgrew was handed a great chance to put his side ahead when Jim Goodwin was adjudged to have handled in the box, but Craig Samson sprung to his right to palm the spot-kick away. The Celtic defender's day went from bad to worse when he conceded a penalty at the other end for an even more blatant handball. Former Parkhead midfielder Paul McGowan made no mistake to put the Buddies ahead, and Stephen Thompson volleyed past Celtic keeper Lukasz Zaluska to make it 3-1. Mulgrew scored with the last kick of the game, but it wasn't enough to save his side as St Mirren advanced to a final against Hearts. Follow Andy Burke on Twitter.